I began my journey midday as i headed to Carlisle Train Station so I could get the train with Lauryn, Becky and Cathrene as we traveled over to Newcastle. As soon as I arrived I headed straight to the Metro Radio Arena as I had heard people had already began queuing for pod (standing area). I was greeted by the biggest hug from Amy as we ran towards each other, it was like we hadn't seen each other in over a month. I quickly joined the queue with Jess and a few other girls she had been talking to previously who were all extremely nice. After hugging Jess and reuniting, one girl had brought jenga and cranium so we decided to be big kids and play. I was totally useless at jenga and as for cranium, Jess and I lost because guessing the word 'piano' when its spelled backwards was difficult okay. Shortly Emily joined us and we decided to buy some merchandise, without going ridiculous and buying it all I got their tour book and fabric bracelet. 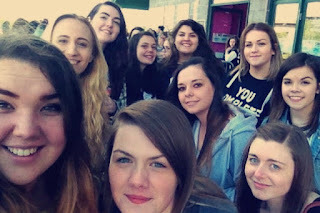 Once we were in the arena we got our very special gold, 5SOS pod bands showing we were the elite. Once we were in the pod, on Michael's side, we tried to get as close as we could to the barrier but didn't manage to well so we stood waiting for a while, and every now and then we tried to squeeze closed to the front or at least so we had a good view. After a bit, the music videos came on, which got everyone signing along. It was soon 7:30pm and Hey Violet came on stage. At first I wasn't to keen on them at first but by the end of their set I was beginning to like them more. They did a cover of Blank Space by Taylor Swift who is my favourite solo artist and they totally changed the style of the song but it was good to hear a different version. By this point the entire audience was hyped and just wanted the boys to come and blow us all away. Counting down from the end of Hey Violet's set to 8:30pm, was the longest 30 minutes of my entire life; all I wanted was those four Aussie idiots to get on stage and absolute smash it. 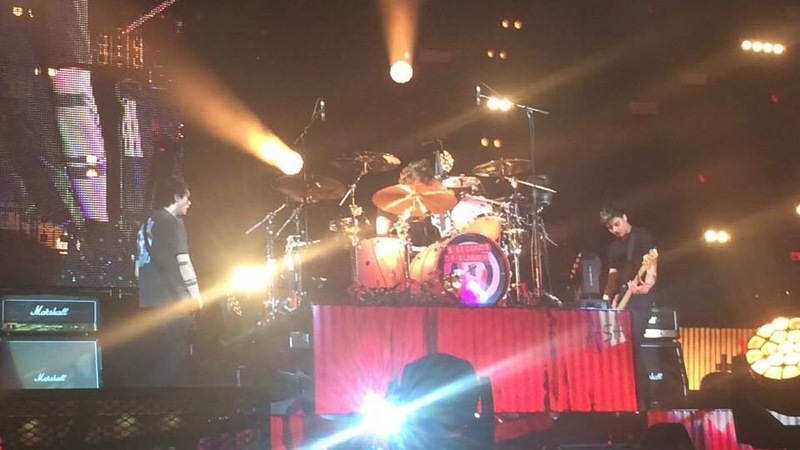 The time had come... Ashton Irwin was first up as he was slowly raised up on his drums for the audience to see him. Already I was screaming like crazy as he is my favourite, then followed by Luke, Calum and Michael and by this point I was practically in tears to see them live less than 5-10 metres away from me in person. Shortly after they made their first appearance on stage they kicked it off with End Up Here followed by a few favourites of mine such as Heartbreak Girl and Voodoo Doll. I hadn't listened to their new song, Permanent Vacation until then and it was so catchy I picked it up quickly and was singing along loud with them. The entire audience was yelling, '5SOS' over and over again begging them to come back and do an encore, which they did. Closing the concert with She Looks So Perfect, Good Girls and What I Like About You. The came to the front for a final bow where Ash decided to throw his drumsticks to the audience, if I could show you the video I would because he nearly threw it to where I was stood but carried on walking and threw it to those who were seated. I don't want to go into too much detail as so much was happening, I'd be there a while telling you every small detail and feeling. I'll leave you with photos and you see for yourself how amazing it was and then you'll understand why I was unstable at the end of it all. 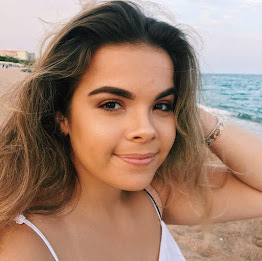 You probably recognize Jess from my previous post about my experience at The Vamps Arena Tour, however this time we got to spend longer than 5 minutes with each other. I have to thank Jess and Beth for offering me a Pod 1 ticket, which I am very grateful of. This was mine and Jess' first gig together, and it was the best day and our time together was well spent. We took plenty of selfies and joined as team together to play cranium. Let's just say as soon as the boys walked on stage we had to hold hands because seeing them so close was scary but amazing at the same time. Also I finally got to meet the one and only Emily Wilkinson, who is such a kind, lovely girl.